The Canadian penny is no more worth its value. A Canadian Senate committee has urged the government to remove the penny from circulation, saying the cost of producing it exceeds its financial value. “The fact is that the penny is not of much use anymore,” committee chairperson Richard Neufeld said. 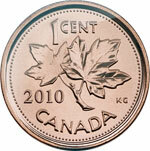 There are roughly 22 billion pennies in circulation, or about 600 for each Canadian citizen. A 2005 study found that getting rid of the penny would save more than Canadian $131million (US $130 m) in the cost of producing, storing and transporting the coins. The committee recommended the coins be withdrawn during the next two years. “Most of us know the penny as little more than a nuisance that slows down the line at grocery stores, and ends up under our couches or in drawers,” Neufeld said.